Iranian authorities have cracked down on dissent since the June presidential election. Tehran, Iran (CNN) -- Five people arrested after street disturbances erupted in Tehran during the recent Ashura holy day could face the death penalty, an Iranian semi-official news agency reported Thursday. The Iran Labor News Agency reported that the five will be tried for Moharebe, or waging war against God -- a charge that could be punishable by execution. ILNA attributed the information in its report to the Iranian judiciary. The case will be tried "soon" with defense lawyers and a prosecutor-general representative present at proceedings. "Confessions of the accused and the investigations of the authorities" will be considered, ILNA said. Abbas Jafari-Dolatabadi, prosecutor for the Public and Revolution Courts, had stressed that people who created disturbances on the Shiite Muslim holy day of Ashura "by setting fire to public property and other similar crimes" were engaging in acts "tantamount to Moharebe," ILNA said. "The judiciary will severely confront those people based on the law," the report said. Anti-government demonstrations began after the disputed June 12 presidential vote, which re-elected hardline President Mahmoud Ahmadinejad over main opposition candidate Mir Hossein Moussavi. But late December marked the deadliest clashes since the initial protests broke out this summer. At least seven people were killed and hundreds arrested, witnesses said, as they took to the streets on Ashura, which occurred on December 27. 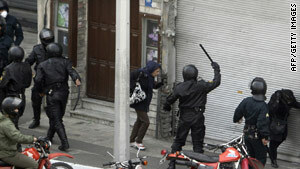 The Iranian government has denied that its security forces killed anyone and has blamed reformists for the violence. At times, video has shown protesters apparently turning on security forces.